Still on the mend following July’s season-ending ankle surgery, Stephen Drew had plenty to smile about Friday. 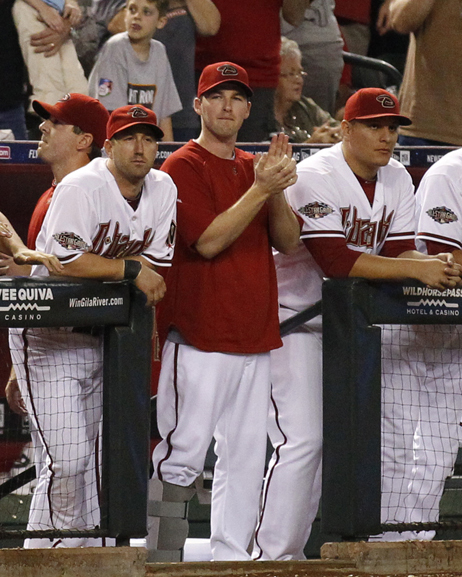 Wearing a walking boot, the recuperating infielder was in the D-backs’ dugout for the National League West-clinching victory over the Giants, before joining his teammates for the big postgame celebration in the home clubhouse. While Drew would have obviously preferred for his return to the postseason to be as a player, he is more than content to continue playing the role of supportive teammate after the D-backs took home their first NL West crown since 2007.